A Trebuchet was a device used in wars and sieges in the Middle Ages. It could be used to throw stones at ramparts, trying to break them down. It could also be used to throw things over the walls of a city. These could be corpses of animals or people that had died of the plague. Trebuchets were more accurate than other medieval catapults. The trebuchet works in a simple way. The basket of the trebuchet is filled with heavy rocks. This acts as a counterweight for the other end, which is usually filled with one large rock. Several men arm the trebuchet by raising the counterweight up and the firing arm down. At this point the arm is released, the heavy basket swings down and the arm swings up, launching the rock far and fast. The sling adds an additional 10-15 feet of arm length and gives the projectile a whip like speed then releases. The sling gives the projectile most of its speed. 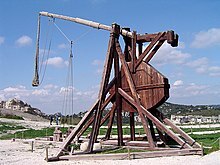 Wikimedia Commons has media related to Trebuchet. This page was last changed on 1 May 2018, at 18:46.